An award-winning architect discusses how he balances artistic vision with pragmatics and finds the inspiration of a sense of place when designing a dream home. Very few people will ever be lucky enough to see a dream home come to fruition. Building a home that achieves more than just a sum of the parts and resonates with an intangible sense of place is easy to talk about, but elusive to actually achieve. It starts with finding an architect who can embrace the conceptual nuance of sense of place and can translate that into a dream home. “Usually new clients come to us as a referral, which is very flattering,” says Mark. Before meeting him, potential clients have often developed a shortlist of architects they believe possess a design aesthetic compatible to their sensibilities. “It is a natural human trait to attach ourselves to design that is appealing to us as individuals,” says Mark. “Over the years, the compliment we receive the most consistently from clients and people who know our work is an appreciation for the diversity of our designs from one project to another.” He adds that it is this pursuit of individual design expression that sets the firm apart from many architects whose designs repeat from one home to the next. The design process usually takes six to twelve months and encompasses preparing the construction drawings. For some clients, it is difficult for them to envision how a plan on paper will appear when it is built, so it is important for the de Reus team to convey ideas with sketches, water color perspectives, 3-D renderings and scale models. The initial site planning fits the building to the land and finds inspiration from place. “Each site has a context that comes to bear toward finding appropriateness and a sense of belonging,” says Mark. After working in many locations around the world, living in Indonesia, and embracing many cultural influences that relate to design, de Reus has developed a unique toolbox of abilities that have come from these experiences. Artistic tension is a tool Mark likes to employ in the design effort. He finds that fusing various influences together within a concept develops a richness of experience: asymmetry within or alongside symmetry, the casual against the formal, the axial and the episodic, and the monumental next to intimate scale. For him, it is a way of combining influences into an integrated vision and crafting the experience of the building. Finish materials are studied and selected for their contribution to the architectural concept and anchoring toward sense of place. “We like to use beautiful natural materials and let them read clearly as they are. An honest use of materials left natural will resonate in natural settings.” It has been de Reus’s experience that his clients have an appreciation of the beauty of natural materials. 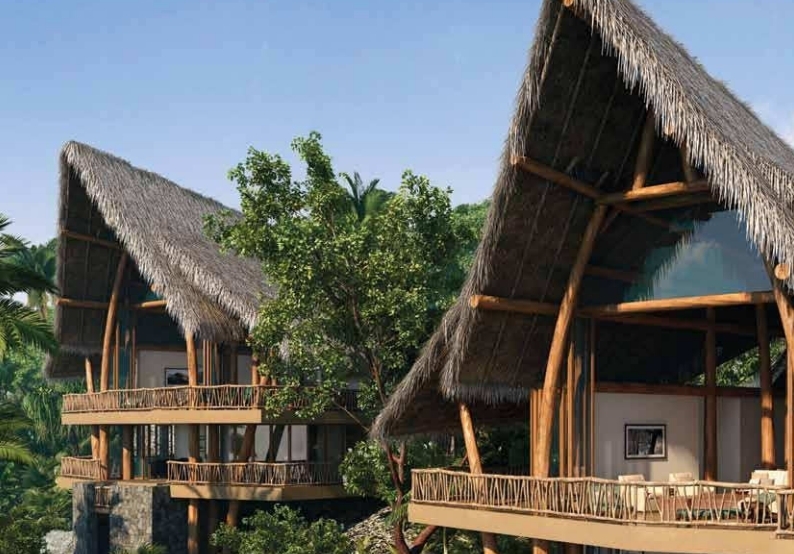 “My motivating factors in writing Tropical Experience: Architecture + Design were sharing my enthusiasm for the practice of architecture, discussing the qualities of timeless design, and showing how we evoke the spirit of each place by noting the unique circumstances for each property, as well as the collaborative relationship between a client and architect,” says Mark. His book is a series of design stories pulled from de Reus Architects’ most prominent projects in Hawai’i, Mexico, Belize, and more.